Being able to know when and where your horse is going to take off in front of a jump is necessary not only for safety and confidence, but is also a major factor in the enjoyment and success of jumping. Seeing a stride is thought off as being wholly experienced by the rider. However all horses are capable of seeing their own strides, and organising themselves for take off, as long as they are given the right opportunity during the approach. If seeing a stride is purely under the control of the rider, then the horse is no longer empowered to get himself out trouble. Likewise, if the horse is left to cope on his own on the approach to a fence, then the outcome is unlikely to be good. Therefore, a good takeoff is the result of teamwork between horse and rider, with each having their own responsibilities during the approach to the jump. The first fact to bear in mind is that the horse has a blind spot in front of his head which extends forwards about 3 to 4 feet. This means that as he approaches a jump he is making his assessment of where to place his feet somewhat in advance of what we would. Compare that to our eyesight, which allows us to see the bottom of the fence right up until take off. 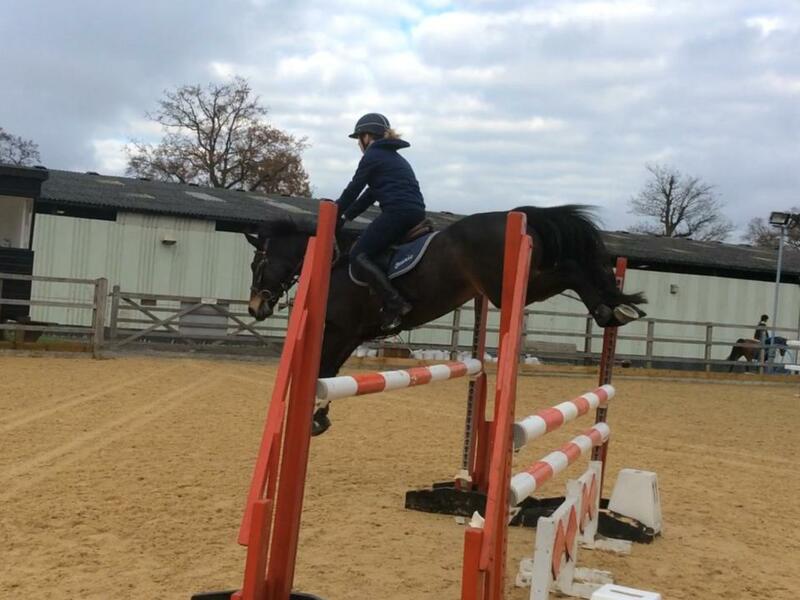 If you were to look at the top of the jump (or pole, in the case of pole work) through the horses ears, and travel towards the jump, when the top pole goes out of view, it would be at a similar time to when the horse can no longer see the fence. This is why trying to make adjustments in the last two strides can affect the horses confidence. So what are the rider’s responsibilities? It is the riders job to present the horse at the jump straight, in a good rhythm, and with enough impulsion or forwards balanced energy, keeping their own focus on the top pole of the jump. The horses stride should not be to short and choppy, but neither should it be looking and flat. Ideally a good medium canter of about 3.5 to 4 metres per strides depending on the size of your pony or horse. When a good medium canter is maintained, the horse is more able to lengthen or shorten as necessary. It is also the riders responsibility to have a balanced and stable seat, so that they are not using the reins for balance, or giving conflicting messages of whoa and go with their body. With the rider being clear on their role, this leaves the horse free to organise himself to negotiate the obstacle. What is the horse’s responsibility? It is the horses responsibility to organise his feet for takeoff so that he can safely clear the fence. Often, when things have gone wrong these responsibilities are reversed. The horse may be in charge of his direction and how fast he is going, and subsequently the rider has tried to take control of the horses feet at takeoff, in a last ditch attempt to feel in control! For a rider to know that they are on a good stride to a fence it usually means that the horse has also seen his stride too. In other words, both horse and rider have a strong kinaesthetic sense shared between them that they are travelling at the correct speed and rhythm to arrive at the fence safely, but ultimately this is registered in the riders mind as a visual check, hence “seeing a stride”. So, seeing a stride is actually only possible if the rider has prepared a good approach and focuses on the top of the fence rather than the base, and the horse feels balanced and able to adjust his stride. This is where a good partnership makes the difference, as the horse may well make a good decision about what he needs to do, and it’s vital his rider stays balanced and focussed. 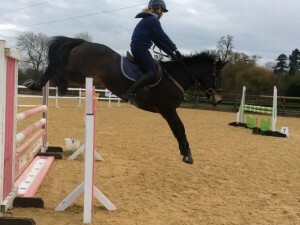 Alternatively, the rider may need to adjust the stride herself, either by lengthening or shortening, and it’s vital that the horse listens to the rider. To be able to know where take off is going to happen, the rider has to stick to her responsibilities, and have faith in her horse. Only then will the horse start to build his own confidence, and convey a kinaesthetic signal to the rider that he knows where he is going to take off. 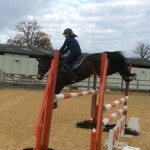 The rider will feel that takeoff has been planned is going to happen successfully, long before they see it, so it’s vital to be really noticing your horses balance and rhythm on approach to a fence. The rider has to learn to listen to their horse, to know when he has made a good decision about takeoff, and when he might need some help. S=rider Steering straight to the fence, focussing on the top pole. This entry was posted in Biomechanics and tagged eventing, seeing a stride, show jumping. Bookmark the permalink. Riding lesson jargon and arena language!